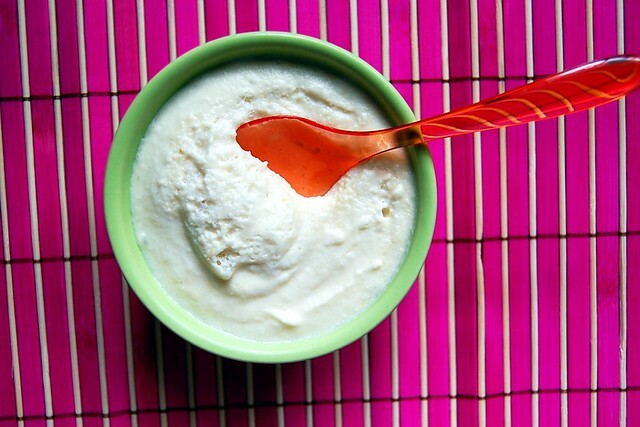 In a large mixing bowl, using a mixer on high speed, beat egg whites until stiff peaks form. In an additional large mixing bowl, using a mixer on high speed, beat cream and 1/4 cup sugar until stiff peaks form; fold egg whites into whipped cream. In a large mixing bowl, using a mixer on medium speed, beat mascarpone, melted white chocolate, vanilla bean seeds and lemon zest until well combined and smooth; fold egg white-cream mixture into mascarpone mixture until just combined. 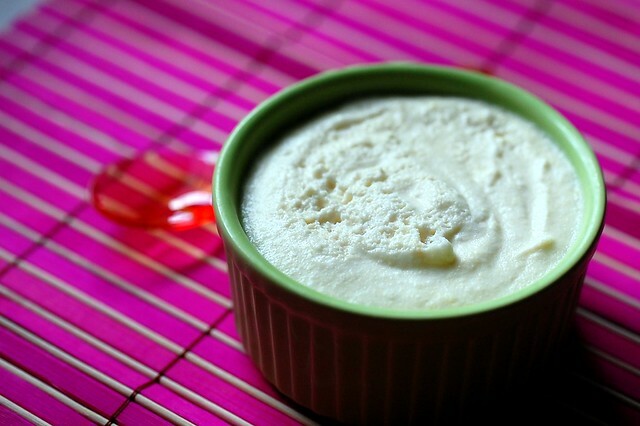 Divide mousse into 8 ramekins. Cover and chill for one hour, or until ready to serve. To make the raspberry sauce, combine remaining 2 tablespoons sugar, raspberries and lemon juice in a small saucepan over medium heat. Bring the mixture to a boil, stirring frequently, and crushing berries with spoon; boil 2 minutes. Transfer raspberry sauce to a food processor, and puree until smooth. Strain sauce into a small bowl. 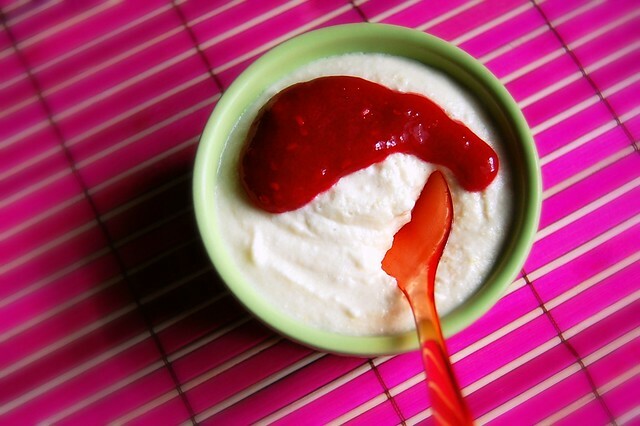 Serve mousse with a drizzle of raspberry sauce. 24 comments on "Mascarpone White Chocolate Mousse with Raspberry Lemon Sauce"
I am with you on the white chocolate thing..it is by far the most underappreciated of the chocolates! Mascarpone and white chocolate, hum, let me think... Of course it's a perfect combination of flavors... And with a red fruit, it's like heaven. This mousse, I really really want to prepare it! And I will! Um...YUM. This looks so delicious! We're kinda obsessed with anything white chocolate and raspberry...! Triple cream brie was really all you had to say...and then you started talking about crazy things like mascarpone and white chocolate. This is one loaded post. Whow great mousse! I ove the resberry sauce and its acid touch with the lemon! Your photos made my mouth.water. YUM! And I LOVE the background. Is that called fuschia? It's so funny. When I was young(er), I used to rail against white chocolate. Now I LOVE it and white chocolate mousse is one of my most favorite things. And making it with mascarpone is kind of brilliant. I've never actually cooked with marscapone before but this is a recipe I'd really like to try it with! I've recently discovered mascarpone cheese and fell in love. This mouse looks so light and summery! The texture of that dessert looks incredible! oh wow, this looks so amazing! And I love white chocolate too- why does it get such a bad rap from diehard chocoholics? Gah, this looks fabulous. As always. Have a wonderful week, dear! White chocolate? It used to be illegal to sell it as "chocolate" in the US due to the fact that it is just vanilla-flavored cocao butter with some stabilizing fats thrown in. They used to have to call it "white confectionary bar" or something like that. I'm a regular chocolate mousse preferr-er I must admit. I have had some superior white chocolate mousses that while are not the dark delciousness I crave, have been quite good, so I would not be the least bit averse to trying this - especially when it's made with mascarpone. 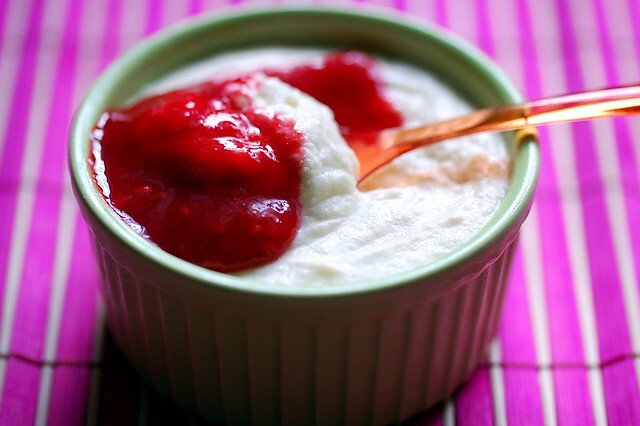 There isn't much you can make with mascarpone that's bad and it does go so well with raspberries. I never seen that frozen yogurt flavor before, but I'm definitely going to be on the lookout! This mousse looks fantastic..I see white chocolate creeping up into many of my recipes lately so I'll be sure to give this one a try! long-time member of the white chocolate fan club here. this looks like one heck of a heavenly treat, emily--the raspberry sauce is perfect! I love your blog and your passion for making and eating food. I love white chocolate but my favorite frozen yogurt flavor is Taro. Most people hate it but those who love it REALLY LOVE it. My yogurt store carries a dozen flavors at all times and I sample a lot of them but always just get Taro with granola. Yum! This looks so refreshing and delicious. I am definitely adding this to my todo list, asap. yum! Sue, I think it is! Marie, I'd love to try taro! I think I'd like it too. That meal sounds fantastic! And this dessert looks and sounds delicious! Thanks for sharing! !